At the end of every ski season, Basin Sports ski shop holds a party, the Basin Blastoff. Part of that celebration raises money for a local charity. 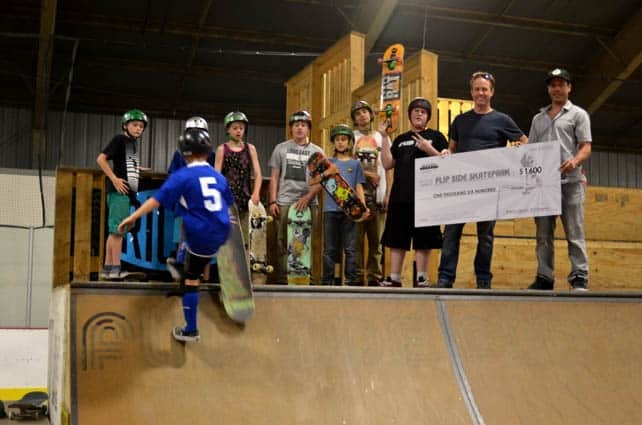 This year the funds went to the Rutland Recreation Department for Flipside Skate Park. The party raised $1,600 and that donation was matched by the Rutland Recreation Department so that Flipside can build a new section of the park. Brett Williamson from the Basin explained that they chose Flipside this year because the park is always struggling to find funding. Williamson’s son goes to the skate park often, so he has become familiar with its plans, as well as its funding obstacles. The park offers camps during the summer, and it is a great place for kids to hang out in a safe, supervised environment. Located at Pine Hill Park (Giorgetti), Flipside Skate Park is an asset to the region. Find it at 2 Oak St., Rutland. For more information visit flipsidepark.com.